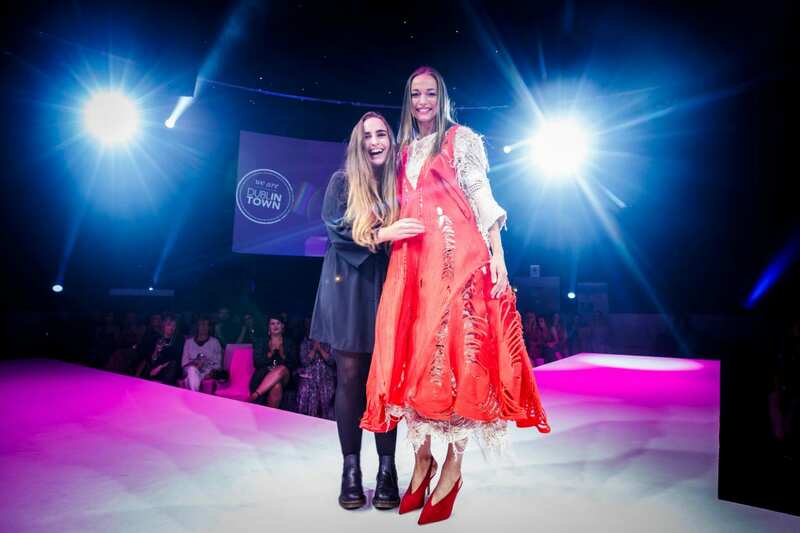 Last night we crowned our Young Designer of the Year 2018 Award to Michelle McAuley! DublinTown Fashion Festival was delighted to have had all 10 of the Young Designer of the Year finalists for 2018. The finalists’ designs took to the catwalk opening our fashion show, which took place in the stunning surroundings of The Round Room in The Mansion House on last night, Wednesday, 12th September. Michelle McAuley, who studied at Edinburgh College of Art, hails from Glenarm, Co. Antrim and was truly inspired by her Irish heritage, skills and craft. Her main aim for her collection was to go beyond traditional textiles by using unconventional methods and mixing Irish craft and contemporary fashion which Ireland is renowned for. Wearing a stunning burnt orange and traditional yarn two-piece dress, model Irma walked down the X-staged runway wearing Michelle’s design. Head judge Bairbre Power announced the winner, which took Michelle by complete surprise. Her smile couldn’t be bigger as she herself stepped onto the runway to walk alongside her model and design. 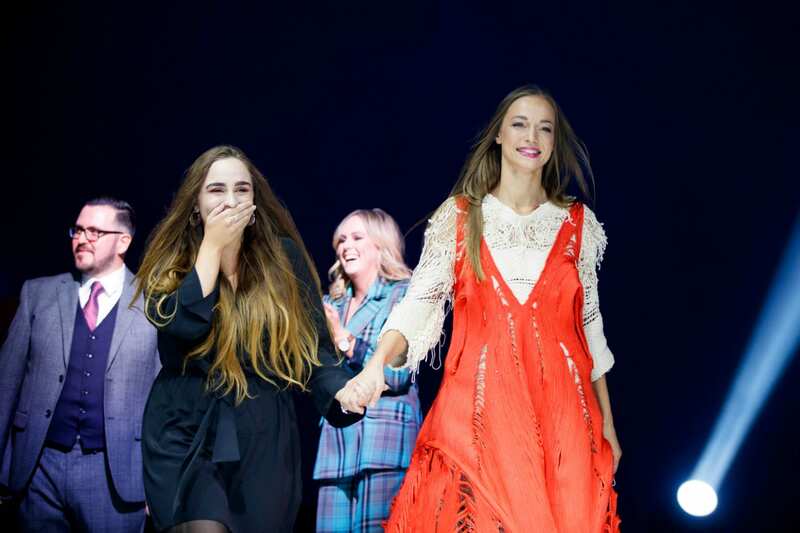 The 10 finalists and their designs will took part in a spectacular catwalk show in the stunning surroundings of The Round Room in The Mansion House on Wednesday, 12th September 2018. The 10 finalists were chosen by a select judging panel including Irish Independent’s fashion editor, Bairbre Power; renowned fashion photographer, Barry McCall; TV3 Xposé series producer, Debbie O’Donnell; owner of The Design Centre, Ashling Kilduff; Brown Thomas personal shopping manager, Caroline Hanratty; Arnotts head of personal shopping, Clara Halpin and Evoke.ie editor, Sybil Mulcahy. Young Designer of the Year. Along with the coveted title prize, the winner will also get the invaluable opportunity to shoot a fashion portfolio with fashion photographer, Barry McCall. Each year when I think we can’t get better than the last, again I am left amazed by the talent, and this year’s entries have been of an exceptional standard. Ireland’s future designers are really waving the flag for this country in terms of fashion design and innovation. 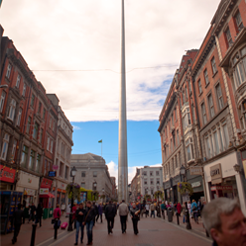 We see it in stores and boutiques across the country, especially in the Creative Quarter of the city centre. It’s great to see well known retailers continue to offer platforms for homegrown talent by supporting and stocking Irish designs. DublinTown is delighted to be part of this platform by showcasing young designers’ talents through the Young Designer of the Year Award. We can’t wait to crown another winner on Wednesday, 12th September.